Can you write a YA paranormal these days and not have it feel formulaic? If you can, I haven't found one. However, what you can do is take those same tropes you've read a million times and do them well. 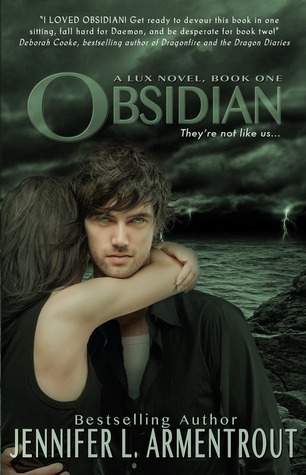 That's what Jennifer Armentrout does with Obsidian. It feels like something I've read before. But it features the paranormal elements I like best and mostly succeeds at avoiding the elements I don't like. It's hard not to love Katy. She's a book blogger! I feel like I'm reading about my own life. Writing Waiting on Wednesday posts. Getting books in the mail. Stepping on books all over the house. Plus, she's a strong girl who doesn't let Daemon get the best of her. I like that she falls into his paranormal world, but doesn't lose herself. She's the type of person who may not have supernatural powers, but she doesn't need to be rescued all the time - or when she does, she doesn't feel like a passive victim. Daemon (whose name I kept pronouncing as Demon) is a very stereotypical paranormal love interest. Handsome teenager who puts on a mean front to protect his family and his secret but can't help falling in insta-lust with the pretty girl. While I liked Daemon and his chemistry with Katy, this is the part of the book I liked least. It didn't feel fresh at all. And I hate the meanness for a reason trope. I fell for it with Edward, but it only worked once. Dee is the other biggest trope. Perky best friend sister. Is there a paranormal series without one? This happens to be a trope that I cannot resist. I loved Dee just as I love Alice and every character of her ilk. It's nice to have a lighthearted character to break up the angst. As for the other stereotypical side characters, Ash = Rosalie, Adam and Andrew = Jasper and Emmett, and Matthew = Carlisle (sort of). I neither dislike nor like the use of this trope. It serves a purpose, although I still snickered a bit. I love having aliens as the paranormal creatures. This at least feels fresh. Their powers are unique and their origin story was fascinating. It was my favorite part of the book and the main thing that got me to keep going with the series. I enjoyed Obsidian. Unfortunately, I do think my apathy towards it is a "it's not you, it's me" kind of thing. I really am tired of paranormal. I've been saying this for awhile, but this cements it. I wanted to get sucked into this series like everyone else is. While I enjoyed it, I couldn't set my skepticism aside. I've already finished the second book of the series and will probably finish the rest, out of curiosity, but I think I need a long break from this genre. I absolutely love The Lux series, and though I agree that it does follow a lot of common paranormal YA tropes, I still couldn't help but fall in love with it more and more as I read each book. Katy was the reason I decided to start blogging a little over a year ago! I don't read a lot of paranormal so I might be worth for me to check this out! I love this series!!! I have the last book and super excited to read it. There are many items in terms of camping equipment that you should bring on your trip. It is very inconvenient to forget to bring essential items like your sleeping bag or tent. Nonetheless, compared with just what exactly you might think now, you may practical experience an improved a higher level enjoyment, rolex replica sale, plus achievement, sometimes inside an imperfect community! In advance of I actually tell you the best way straightforward its to extend a enjoyment you may have inside your life, let’s explore among the list of elements with respect to owning them. You will reckon that, with dreads plus horrors that searchers currently have, how they happen breitling replica sale, that him and i will be directed at ask them to. Just what exactly differentiates your fearfulness including a phobia? Let’s express the subject is definitely altitudes. Any person could proceed to the top rated on the step ladder to undertake quite a few improve your property, a step ladder moves a little bit plus fearfulness at this moment places around. This is usually a good thing while it behaves for a self-protection apparatus. Which includes a phobia, whomever may just be located completely among the bushes and after that a little something causes opinions with altitudes they usually could break out inside of a sebaceous and also develop into taken into position. Next to nothing includes seriously just simply fake rolex, however became psychologically and/or psychologically drunk because of it. Imagine pertaining to your special dreads plus horrors. Its possible you have your nervous about bumblebees, snakes, most dogs, and also horses. It is usually this you’re fearful with altitudes, tiny hublot replica, elevators, and also interacting with innovative people today. In that case, there’s a hated needle. Bring to mind a longines replica sale time frame you have a go along at the doctor’s business.